This hotel enjoys stuning sea views and offers a fantastic range of facilities. Situated on a 25km stretch of fine white sandy beach, with watersports available including diving, this is a popular choice for couples and groups of friends. The hotel was a very good design,our room had a fantastic view to the beach and the sea. The hotel while mainly catering for German guests was first class and the food excellent. A 15 minute walk took you into the resort centre, where there is a good range of shops and restaurants. We arrived at the hotel on New Years Day night with no rep to accompany us and as the only couple from the flight travelling not just to this hotel but to the resort. The staff were excellent from our arrival to our departure. The majority of the guests were German, but as they were it was nice and peaceful and the children were all very well behaved! The entertainment in the hotel was very good, there were plenty of daytime activities for the sporty. The evening shows were good fun, although the staff were miming they put everything into it and as we got to know them all well this made it more fun. The food was excellent with a large selection, something for everyone. It was the most relaxing holiday we've had, and the only one where we have had no complaints. Great for someone wanting a relaxing, pampering holiday but not for the clubbers. We stayed in this hotel in October 2004. Fantastic hotel with 3 pools plus a kids pool. Food was fantastic with loads of choice, smoking section in the restaurant for people who wish to smoke. Great shop inside the hotel selling papers, crisps, chocolate, postcards, gifts, cigarettes etc. My only criticism is the picture in the picture is very misguiding and shows the hotel right on the beach. Although the hotel is right on the beech you have to go down to the ground floor and then down a massive slope and then it is a good walk to the sea! A good shopping centre in the centre of Jandia (spent a fortune on designer gear) but haven't seen anyone in the UK wearing what I purchased! Be careful by the pools as they have painted the paving outside which makes it very, very slippy with wet feet. You have got to have a go at the bingo while you are there (in the glassed area where you have luch), it overlooks the sea and is a nice break from the sun as it is undercover. Well of the 200 people who disembarked from the Bristol flight, only 18 of us got on the coach for the resort of Jandia...or as it should be called BERLIN BY THE SEA...due to the proliferation of German tourists, german bars and german speaking spanish waiters. On arrival at the Hotel Faro Jandia, only one other couple stayed at the hotel along with us. At first glance you dont notice the front of the hotel as the entrance is almost hidden between a duty free perfume shop and and a video games arcade..but enter thru the large electronic glass doors and you walk into 4 star heaven. The hotel is spotlessly clean with an army of maids in action every morning and has what I believe is termed art deco design. The reception staff were Professional, polite and friendly almost to the stage of obsequious!!! The building is in a large arc and the rooms towards the centre afford a pool view and sea view ( 4th floor or higher) of whichThere were about 200. Across to the other side of the arc were a straight row of about 50 rooms facing inland/pool only. The room was spotless, providing Sat TV, hair dryer, fridge with fully stocked minibar, Bath, shower,bidet,Telephone,Safety deposit box ( 12 euros a week ), Bath robes!!! Slippers!!! and towels including pool towels that could be changed every day at reception. Nice private balcony and maid service everyday with clean sheets 3 times a week. On the 7 th floor was a gym adequate unless you are a serious trainer and then it would not be up to scratch. sauna, and massage place. Breakfast was 8 till 10 and evening meal was on 2 sittings, which you have to decide on on day one...either sit down at 6.30 pm or 8 pm. The food was excellent and plentiful and was buffet style eat as much as you like ..also the was an area were chefs were preparing food such as swordfish, steak etc etc, so after your fill from the hot and cold buffett you could go and get more to eat from the chef . The puddings were also plentiful, varied and delicious. Again I went up 2 or 3 times for various fattening cakes, puddings and ice creams. There were about 200 sunbeds around the pool and the maids were out at 7.30 am cleaning them all...sunbeds were not allowed to be reserved...this confused the Germans brains!!! And the pool was open officially 8 am till 8 pm but every morning people were swimming from about 6 am !!!! The waiters patrol the sunbed area frequently...I only used them sparringly as the hotel drinks were very pricey...4.5 euros for a iced coffee . There was a mini golf course and 3 tennis courts with 2 pro coaches ..annoyingly it cost 8 euros to rent a court and most of the time the courts were not being used. The Animacion team were not that enthusiastic but it was not all their fault as a large proportion pf the guests appeared to be late 50s to late 60s age group so didnt want to do much. There was a kiddies area...swings etc and a mini disco and nightly shows for guests, but not enough waiters on duty for the size of the audience so you waited 20 minutes to get any drinks you orderded. There was a internet Pc but it was slow and pricey so I used the faster cheaper ones in the video arcade outside the hotel. The hotel is ideally situated right in the middle of the shops and the beach is right across the road. How does the hotel compare? 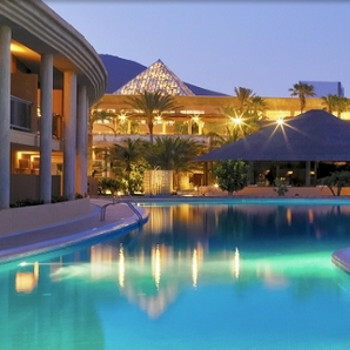 Last year we stayed at the 5 star Aeneas in cyprus and the year before at the Maspalomas princess in Gran Canaria It wasnt as large as these 2 but it was on a par with them...My wife thought it was a good hotel and I too was impressed.